“Bobby T turns up with a new single after debuting “Elo Lockup” in 2013, the song was one of the controversial singles of that year; alot of Nigerians though it was Olamide and it’s a similarity Bobby T accepts. 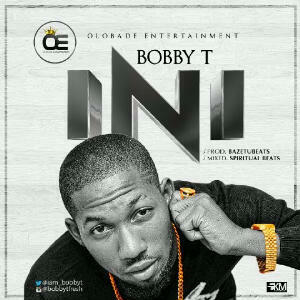 Bobby T re-ups with another song called “INI”, these is the second time the Olobade Entertainment signed artiste will be making a statement, he hits the club with a lowkey banger, and delivers some winning line on “INI”. This is not surprising. Whether in his work as Bobby T (born: Fashuga Olatunji) or in his other creative pursuit. He has been as much a rapper than a singer-songwriter, but this time he tears up the club over the Bazetubeatz booming production, the song was mixed and mastered by Spiritual Beats.